« Qu’est-ce qui a mal tourné en islam ? » est une question qui continue à hanter les musulmans depuis plus d’un siècle. Les réponses posent pour principe que l’erreur doit être cherchée au sein de l’islam. Une seule voie se présenterait donc pour corriger cette erreur : l’islam doit s’engager dans la voie occidentale, éprouvée, de la réforme et des Lumières. “What went wrong with Islam?” is a question that continues to beleaguer Muslims for well over a century now. Answers, both from within or without, start from the assumption that the error must be sought in Islam and that the state of the West is marked by a quasi-natural rightfulness. Consequently, to correct what went wrong only one way quasi-naturally “presents itself” to both views: Islam must emulate the historically proven Western way of improving on religion, that is, the way of the Reformation and the Enlightenment. كثُرت الآراء حول أسباب تأخر الامة الإسلامية وتقدم الحضارات الغربية خاصةً فى القرنين الماضيين. ومع إختلاف النظريات نجدها تجتمع فى حكمها على أن الأمة الإسلامية قد أصابها الوهن بسبب دينها سواء لإهمالها له أو لتزمتها به ورفضها الفكر العلمي، بينما نجد أن الغرب قد تقدم بسبب علمانيته، أي أيضاً من منطلق علاقاته بالدين والفكر العلمي. وقد حظي هذا المنظور بشعبية بالغة على كل المستويات الفكرية في الشرق والغرب حتى لم يعد أي تحليل يخلو من الرجوع إلى «الدين» و«التدين» كأحد الأسباب الرئسية لتقدم الأمم أو تخلفها. ومازالت هذه النظريات تغذي الفكر الإصلاحي الإسلامي حتى اليوم سواء من الإسلاميون الذين يريدون ان يسترجعوا العصر الذهبي للإسلام أو من التقدميون الذين يريدون أن يحرروا أنفسهم من تبعيتهم للماضي في محاولة اللحاق بالغرب. وكان جواب الأمير عن السؤال المطروح عن أسباب تخلف الامة المحمدية في غاية الأهمية. فقد ُسئل الامير كما ورد في كتاب «المواقف» عن أسباب انكباب المسلمين على استحسان أحوال الغرب والاقتداء بعادات أهله وعقائدهم وظنهم بأن الغرب حصلت له الغلبة بنصر الله له لصفاته وأحواله. وأجاب الامير بأن السبب يكمن في أحوال الامة المحمدية نفسها، فهي قد خالفت أمر ربها و «نبذت شريعة نبيها» فخذلها الله وتولاها «الاسم الالهي الخاذل» فلما حاربها الغرب خُذلت وانهزمت، والمغلوب ينظر الغالب بعين الكمال اعتقاداً منه بأن سر انتصار عدوه يكمن في مجمل أحواله فيقتدي به ويتشبه به ويتكلم بلغته ولسانه ولسان عقيدته... ولذا أصبح قادة المسلمين يقلدون الغرب ويستمدون فكرهم وثقافاتهم منه واتبعهم فى ذلك رعاياهم كما جرت سنة الله فى خلقه «الناس على دين ملوكهم». ومن أخطر ما اقتبسوه هو الفهم الغربي للدين «كمنهج دنياوي» . وأردت أن أبحث فى كتابات الأمير عبد القادر المنشورة تحت عنوان «كتاب المواقف في بعض إشارات القرآن إلى الأسرار والمعارف» عن رأيه فى هذا الشأن خاصةًً وهو شاهدٌ على عصر بداية الإحتلال الغربي للأوطان الاسلامية وهو أيضاً شاهد على بداية صحوة الامة الاسلامية والنهضة العربية وذلك كي أستدل على مدى صحة هذه النظريات ومعرفة الدواء بمعرفة الداء . 1In the politically and intellectually agitated Arab and Islamic world of the late nineteenth century and the twentieth century the angry Arab intellectuals were engaged in a search for an identity that would enable them to respond to the challenge which issued from Western colonial supremacy. The charismatic figure of Jamâl al-Dîn al-Afghânî attracted a wide circle of young male students and disciples like Muhammad ‘Abduh, (and later) Muhammad Rashîd Ridâ, ‘Abd al-Rahmân al-Kawâkibî, and many others who were to become the rhetoricians of the modern reform movement (islâh). In their bid to counter “the West”, these young activists were eager to throw off what they considered as the shackles of traditional learning and of religious authority, and to speak the language of modernity, i.e. rationality. Muhammad ‘Abduh, the future reformer and secularizer of al-Azhar, rejected the traditional centres of education because they taught nothing “new” and “were averse to studying the new sciences”1. Al-Kawâkibî (1855-1902), in his semi-fictional novel, Ummu al-Qurâ: Proceedings of the First Conference on Islamic Renaissance 1316 H (1899), saw in the ulama, i.e., in the traditional scholars of Islam, only “blind ignorance and petty imitators” and condemned Sufism as the religion of “the weak-minded and superstitious”2. 2Writing within the constraints of this perception and with an unquestioning acceptance of its validity, these reformers sought to “awaken”, “enlighten”, “liberate”, “modernize”, discipline, and silence their “ignorant”, “superstitious”, “fatalistic”, “irrational”, “backward”, “tradition bound”, “fanatic” Ottoman-loyal rulers, ulama, sufi shaykhs, and so on. Criticism and reform was to be achieved, firstly, through the power of words: as al-Afghâni had instructed his students and journalist followers for whom he had obtained licenses to publish in the rhetoric of social revolution and political activism and to direct their jihad onto the corruptive forces within Islam3 and so did al-Kawâkibî assign the activists of his generation the role to conduct a rhetorical jihad against the ulama and fuqahâ’, and the sufis. 3Whatever the particular figures describing the forces of decline of the Muslim lands, be it foreign Islam, false Islam, or dead Islam, they (the representatives of pre-modern “traditional” Islam) were all identified by the same name-tag, namely, as figures of “resistance to modernization” and therefore as “causes of what went wrong”4. Correspondingly, the causes for “backwardness” and, thus, the targets of reform were located in the traditional institutions and repositories of knowledge that had for centuries informed and shaped the pluralistic diversity of the Islamic self: namely, the ulama, jurists, and scholars, keepers of the “outward” knowledge of the law, and the sufis, keepers of the “inward” knowledge of the heart. All of these had to be changed, silenced, or sacrificed in the relentless march toward reform5. 4The resulting modern, reformist discourse on Islam (and of Islam) was characterized by a nearly obsessive urge to dichotomize. Nearly every text saw it as its central concern to distinguish “true” from “false”, to brand all “false Islams” as “obsolete”, and to establish in contradistinction the “true Islam” found conveniently in a reconstructed or “imagined” Arabized Salafi Islam of “the Arabian peninsula” preserved by the racially and linguistically pure Najdi Arabs. Thus a modern, and imperceptibly western, idea of religion that went against centuries of historical and intellectual evidence immerged out of this period to replace traditional understanding of religion and the relation of the human to the divine. A telling example of this “secularization” of religion is the almost imperceptible substitution of the term “dîn” (religion) for “âkhira” (afterlife) and thus the traditional juxtaposition of “dunyâ wa-âkhira” became “dunyâ wa-dîn” in the writings of the reformers. This substitution meant a shift of the place of the religious, where religion, which was originally seen as part of worldly existence and bridging the two worlds of this life and the afterlife, became the counterpart to the secular and both the afterlife and religion were conflated into one. 5Henceforth, to speak of religion meant to speak of historical, social, economic, political, and ideological systems of thought and life and excellence of religion was to manifest in the power it gave to this life. Faith in the essentials of religion: faith in Allah, in prophecy, in angels, and in the after-life became a matter of private conscience, not a matter for public discourse. In the latter, it only served well as a polemical means of political discourse: to slander and discredit the Muslim “other”, the enemy from within. 6However, we have in the writings of al-Amir ‘Abd al-Qâdir al-Jazâ’irî just some years earlier in his exile in the city of Damascus, a perspective that is truly different, and, therefore worthy of thought. For it situated both the perception of the problem of the decline of the Muslim Umma and the suggestion for its solution within an Islamic model of history and not on the basis of the Western experience of modernity with its implications of secularism as progress. By referring to the thoughts of al-Shaykh al-Akbar, Muhyî al-Dîn Ibn ‘Arabî, another of the city’s North African guests and who was buried within its lands, ‘Abd al-Qâdir al-Jazâ’irî reached a level of analysis and comprehension for which the concepts of the “political” and of “modernity” are too shallow. He attributed the degeneration of the Umma to the moment when it turned its back to the Prophet of Islam and to the principles of gathered-ness (jam‘) that he epitomized. Whether consciously or unconsciously, the Umma’s rejection of the Prophet as the “beautiful model” (uswa hasana) amounted to a rejection of the values of Islamic pluralism. 7When asked to respond to the question as to why Muslims were imitating the West and its cultures in the assumption that this is a sure path to progress the Amir gave two levels of answers6. The most “apparent” reason was that Muslims looked in the mirror of their enemy to find the causes of their decline and saw themselves in whatever presented itself as the “difference”: whether the dress, the language, the attitudes towards women, the culture, or finally the religion itself. That is, they tried to know them “selves” and what was wrong about them-selves looking in the mirror of the other and inevitably the knowledge gained was framed by the “gaze” of the “other”. The Amir’s allusion to the futility of this path and its illusory end was to find later echoes in Edward Said’s Orientalism. 8The second answer that the Amir gave, and which interests us here, is one derived from a (prophetic) knowledge that precedes the “phenomenal” world and thereby not held by the contingent (the colonial experience, non-Arab influences, economic forces): all conditions of creation are a reflection of the different Names and Attributes of Allah and it is the character of Divine Self-disclosure that governs each moment and dictates the conditions of the times. The Divine Names which govern the Umma Muhammadiya reflect the relation of the Umma to its Prophet. As long as the Umma was looking at its Prophet and holding onto the Prophet’s teachings it was under the governance and protection of the Divine Name al-Rabb (the Lord). However, once it turned away in disdain from its Prophet, expressing its self-sufficiency and its not being in need of his assistance (istighnâ’ ‘anhu) and rejection of the inherited prophetic knowledge that allows it to read the signs of the times, the Umma came under the Divine disclosure of the Name al-Khâdhil, i.e. the One who forsakes. 9According to ‘Abd al-Qâdir, when the neglectful Umma was attacked by the West its Lord forsook it: its fortunes were reversed and it was left as a prey to the forces of the Western nations. Through the intervention of the Divine Name al-Khâdhil, the protection of the Name al-Rabb came to an end and the Umma henceforth was exposed to the manifestations of the powerful Divine Names (asmâ’ al-jalâla) of Allah, like al-Muntaqim (the Vengeful), al-Mudhill (the One who humiliates), al-Khâfid (the One who puts low), al-Mudill (the One who leads astray), and this will be so until the final hour7. 10Having turned away from the prophetic knowledge that might allow the Umma to understand the real causes for its decline, the Umma simplistically, searched for the causes of success in the conditions of the other, the West and accordingly sought to imitate it in pursuit of its lost power. It adopted the lifestyles of its enemies, thinking that power lay therein: in the culture, language, social structures, ideologies, etc. In the process it rejected further its prophetic-centred identity and henceforth came to know itself only in reference to its colonial masters. The Umma became infatuated with that which it used to hate while it increasingly disdained its original “self”. This age saw the birth of an identity that was derived from difference, opposition, and estrangement. 11‘Abd al-Qâdir’s explanation of what had befallen the Umma leaves us with an important question: why is it that the Umma does not see the roots of its condition and persists in running away from its own traditions seeking to become its “other”? ‘Abd al-Qâdir found the answer to this question in Ibn ‘Arabi’s description of the end of times, which occurs in the third part of the night of the day of the Muhammadan Cycle8. During this period all Muslims are asleep, in a state of unawareness (ghafla) to the extent that they are even unaware of their condition and actually think themselves fully conscious. Their state of ignorance and darkness conceals from them the Prophetic “knowledge” whose end is to “differentiate between [true] knowledge (al-‘ilm) and illusion (wahm). Illusion is but imagination (al-khayâl), which establishes the limits of all of this world9. In this state of illusory knowledge, that is, ignorance, they are oblivious of all of the traditional knowledge (ma‘ârif) that could tell them about the difference and enlighten them in this age of confusion and obfuscation. The “veil of ignorance stands between them and the words of Allah preventing them from hearing or recognizing it”10… they even would deny them and deny those who utter them accusing those who follow the Sunna of rasûl Allâh, and follow his path, like the Sufis, of being the cause of all of the Umma’s decline and follow instead those that fight the Prophet and his lovers11. 12Thus the Amir indicates that already since his times the Umma had turned away its face from its prophet Muhammad, and was unwilling to hold on to his legacy: it carries his name and claims to follow him but in reality it denies him, and is enemy with his inheritors and lovers, giving life to the customs of the Jâhiliyya (pre-Islamic age). 13The Amir curiously did not locate the cause of decline in the Umma’s turning away from the religion of Islam, or from Allah, but rather insisted on the centrality of an understanding of prophecy that determines the fate of the Umma. What is the difference… is it merely rhetorical or is it conceptual? 14The exemplary and essential role that the Prophet plays for ‘Abd al-Qâdir him apart from his contemporaries and their inheritors whether modernists, reformers, Islamists, or secularists. Following the guidelines set by Western contemporary scholars of the time, almost all were eager to limit the role and significance of Muhammad to the historically and rationally demonstrable; they accepted as real only what is scientifically demonstrable12. Accordingly, the character of religious truth and finally all truth became at best a matter of probability and the goal of certainty became increasingly unattainable. 14 Qur’ân 33: 21; Mawqif 1. 15‘Abd al-Qâdir did not accept such a narrow secular view of prophecy and its inherent implications and proposed instead a deeper understanding that is centred in the prophetic hadîth: “I was a prophet when Adam was still between mud and water”. Such an understanding based as it is in a time that precedes all time supersedes any earthly function of prophecy. Prophecy and the Prophet link the world of appearance and multiplicity “al-Zâhir” to the hidden world of essential unity and certainty “al-Bâtin”13. He, and all prophets, brings together the opposites: the material and the spiritual and their sunna/message is to establish the balance between this world and the hereafter. All knowledge of the functions and conditions of this world (dunyâ) and of the next (âkhira), ‘Abd al-Qâdir discloses, is contained in the meanings of the verse “Verily you have in the Messenger of Allah the most beautiful model”14. The first face in the mirror of al-Haqq reveals all knowledge of the divine attributes, of the wisdom of Divine Grace, and of a cosmology that precedes this world of creation. It gives insight to a meaning of prophecy that precedes its worldly appearance and the true meaning of a humanity or insân kâmil. The second face mirrored in the face of the Prophet looking at his Lord teaches the precepts of exemplary servant-hood ‘ubûdiyya and spiritual poverty modelled on the manners of the Prophet with his Lord, which lend their characteristics to the sciences of religion and jurisprudence, knowledge of praiseworthy manners. The third position mirrored by humanity looking at the Prophet shows the trials and disbelief which all of the prophets and true gnostics and lovers of Allah have met on their path and how most people have responded to their messages of love and faith with suspicion, mockery, insults, rejection, hypocrisy, envy, and hatred. This face reveals the darkness of the ego (nafs) and its resistance to any message that aims to extinguish it power over the mind and its resort to disbelief (kufr) and hypocrisy (nifâq) rather than submit to a higher will. And finally, in the fourth position, in the mirror of the Prophet facing humankind, one finds the model for compassion, love, and tolerance of the frailty of human nature. “One must look”, ‘Abd al-Qâdir writes of the Prophet, “at his treatment of mankind, his love for them and concern for their welfare … his patience with them and his witnessing the Real in them… self-realized in the Divine attribute of Mercy…” From this function is derived the “knowledge of ethics and of the virtues, and the sciences of politics and of religion; that is the knowledge that leads to the order and civilization of this world”. 15 Cf. the letters he wrote to Imam Chamil al-Daghestani and to Mgr Pavy, the bishop of Algiers. 17‘Abd al-Qâdir’s own political deeds reflect these very same religious convictions. As the motivating force for saving the Christians of Damascus (in 1860), he does not name the Western humanist principles of tolerance but the instruction of the Prophet by following his Sunna and also “the rights of humanity” (huqûq al-insâniyya)15. 18The Amir’s advises Muslims to place this verse (“Verily you have in the Messenger of Allah the most beautiful model” - 33: 21) as their point of orientation (qibla) and to not ever lose sight of it or else they would be following the desires of the ego that disdains to follow other than its own self and refuses to bow to another human “chosen one”16. Such an ego is one that knows itself through opposition and separation… the existentialist “I”. 19By placing prophecy as the centre of the faith ‘Abd al-Qâdir stays faithful to his pluralist pre-modern tradition of Islam and departs from his contemporary reformers who claim to place “Islam” or “Allah” at the centre and from there go on to define both according to the limitations of rationality, an understanding of tawhîd that is very materialist at its heart, a mathematical oneness17. 20‘Abd al-Qâdir’s Damascene discourse is truly exceptional, when we remember that he spoke and wrote in a period of the history of the world and of the Islamic world in particular which witnessed an almost uncontrollable desire to label and name and measure. He had realized the destructive, intolerant nature of such rational discourse. “The speech of the rationalists”, he exclaimed, “divides and ends in dissension… Our speech is one and unites”18. ‘Abd al-Qâdir’s harsh critique of rationality is based on an insight into its divisive, intolerant nature that characterizes it even in its pursuit of the One. 22This understanding of a basic flaw inherent in rationality itself permeates all of the text of al-Mawâqif and can explain the gulf that sets ‘Abd al-Qâdir apart from his contemporaries as well as for the attempts to bury his spiritual views in silence. 23Whereas the end of the humanist discourse of toleration is the “accommodation” of difference (exemplified in the principles of freedom of speech and of equality), for ‘Abd al-Qâdir, toleration itself is what should occur at the end of all speech. “Knowledge”, he writes in al-Mawâqif “is one, though what is known may be multiple… and the end of knowledge is to differentiate between the sincere (sidq) and the insincere (kadhib) in speech, the true (haqq) and the false (bâtil) in belief, and the beautiful (jamîl) and ugly (qabîh) in deeds”19. In other words, the end of knowledge is that wisdom which allows the knower (‘ârif) to recognize that any and every human being “is a manifestation of the divine attributes of Majesty and Beauty (mazâhir asmâ’ al-jalâl wa-l-jamâl)”20 and that differences between them are not signs of their imperfection but, on the contrary, of their perfection because each one is perfect as he or she is21. Only if one is grounded in such wisdom, can one truly accept others in their necessary differences. 24Though ‘Abd al-Qâdir had had real encounters with the French colonialists and engaged in bloody jihâd with the French army, yet his sense of being/identity and therefore of his “other” seems not to be forged by that experience. On the contrary. In his spiritual autobiography, Kitâb al-Mawâqif he presents to us a man who is stripped of all time and place, engaging with a timeless community on timeless issues… both a-temporal and a-spatial. He is neither referred to as Muslim or eastern, and neither is his counterpart marked by otherness, Western, Christian, Jewish. The term Islam and Muslims very rarely occurs in this three volume work even though the work is about how to be a perfect servant of Allah. Instead nafs / rûh/ insân/ ‘abd are the terms that forge that identity and point to levels of being that belong to all no matter “what” or “who” they are. The book is addressed to the people of his times (as seen from his introduction and frequent references in the text)… but it addresses all according to each one’s level of understanding in line with the great masters of the Sufi path. Strangely, it is this way of speaking and addressing oneself that leaves no place for “otherness”. You are there in all of your states, means ‘Abd al-Qâdir, and nothing of you is excluded and nothing leaves you out. You are the one meant by what you read. As such the works of ‘Abd al-Qâdir allow for a pluralism that goes beyond the letters of the words. 25In contrast with the way of ‘Abd al-Qâdir, Arab intellectuals, including the growing voice of fundamentalism both in its moderate and extremist expression, allowed that which they perceived as threatening to their own identity, namely Western rationality, to dictate the terms of their search and thus pre-determine their conclusions. The grim realities of colonial politics did not decrease their appreciation of Western sciences and technology. Dr. Mamdouh Haqqi, one of the main editors of ‘Abd al-Qâdir’s writings, could not conceal his disappointment in his “enlightened” hero who, after having visited Europe more than once and having, thus, been repeatedly exposed to its latest advances, had not been as duly impressed as was the rest of his generation22. The Amir’s own perception of the value and cost of progress was, indeed, strikingly different. Referring to his visit in Paris in 1852 of a printing press, he remarked: “Today I have seen the letters (instruments) by which monarchies are overcome, and their nations destroyed… without their being aware of it!”23 For him, the introduction in the East of the printing press and its concomitant type of discourse, i.e. journalism and propaganda, foreshadowed events, which became clearer only much later24. Many scholars have, in the meantime, pointed out the connection between the spreading of the vernacular in the printed media and the rhetoric of nationalism and social revolution. The collapse of the Ottoman Empire and the emergence of national states in the lands of Islam were, to say the least, greatly helped by these inventions. 26Though the West was the enemy, especially in its colonial guise, it nevertheless functioned for the reformers as the model to be emulated. The true threat to the reformist agenda came from within: from false Islam, dead Islam, in one word, traditional Islam. Listing the re-newers (mujaddidûn) of the nineteenth century, al-Sa‘îdî refused to include ‘Abd al-Qâdir, though he had admittedly led the war of jihad against the French, and had modernized the Algerian army, because of his involvement with sufism “which contributes nothing to the advancement of Muslims (lâ tanhad bi-l-muslimîn)”25. On the other hand he lists Muhammad ‘Abduh as one of the re-newers of the twentieth century because he incorporates the much needed “Western” sciences. The traditional concept of renewal (tajdîd) is no longer viable; it is displaced with re-form. The mujaddid as reformer is guided in his mission by utilitarian principles of achieving the greater good for the umma: power and glory for a deified Islam. 27‘Abd al-Rahmân al-Kawâkibî ends his semi-autobiographic novel Ummu al-Qurâ in 1899 with the recommendation that we have to keep the question “what went wrong?” alive and to continue teaching it to the coming generations of Muslim youth so that they may keep the wheels of reform turning in that direction. More than a century later of chasing answers to that question and living under its heavy shadow, perhaps it is time to turn to the legacy of Amir ‘Abd al-Qâdir and his offer to infuse a new perception (fahm jadîd) in our lives? Abd el-Kader, 1966 : Dhikrâ l-‘âqil wa tanbîh al-ghâfil, Éd. Mamdûh Haqqî, Damas, Dâr al-Yaqza al-‘Arabîya. Abd el-Kader, 1966-1967 : Kitâb al-Mawâqif, Éd. Mamdûh Haqqi, 3 vol., Damas. Ibn ‘Abd al-Qâdir, Muhammad, 1964 : Tuhfat al-zâ’ir fî târîkh al-Jazâ’ir wa-al-amîr ‘Abd al-Qâdir [1st ed. Alexandria, 1903], Éd. Mamdûh Haqqî, Beyrouth, Dâr al-Yaqza al-‘Arabîya. Kawâkibî (al-), ‘Abd al-Rahman, 1995 : al-A‘mâl al-kâmila li-l-Kawâkibî, éd. Muhammad Jamâl Tahhân, Beyrouth. Ridâ, Muhammad Rashîd, 1931 : Tarîkh al-ustâdh al-imâm al-shaykh Muhammad ‘Abduh, 2 vol., Le Caire, Éd. al-Manâr. Albertini, T., 2003 : “The Seductiveness of Certainty: The Destruction of Islam’s Intellectual Legacy by the Fundamentalists”, Philosophy East and West 53/4. Murâbit J. (al-), 1966 : al-Tasawwuf wa-al-Amîr ‘Abd al-Qâdir al-Hassanî al-Jazâ’irî, Damas, Dâr al-Yaqza al-‘Arabîya. Sa‘îdî, ‘Abd al-Mut‘âl (al-), 1954 : Al-mujaddidûn fî al-islâm min al-qarn al-awwal îla al-râbi‘ ‘ashar, Le Caire, Maktabat al-Âdâb26. 1 Rashîd Ridâ, 1931, Tarikh al-ustâdh al-imâm al-shaykh Muhammad ‘Abduh, 2 vols., Manar Press, Cairo, p. 412. 2 First published in Port Said, 1899 by Muhammad Rashîd Ridâ, a revised version appeared in Ridâ’s (and ‘Abduh’s) al-Manâr. Citations will be from the reprint edition of Muhammad Jamâl Tahhân, 1995, The Complete Works of al-Kawâkibi [al-A‘mâl al-kâmila li-l-Kawâkibi], Beirut. 4 Ironically, the term “traditional” was not so much the result of an in-depth analysis of religion as it was more of a foil for political action. See, for example, al-Kawâkibî, Ummu al-Qurâ, p. 294-303; 310-312; 313-328, 343-50; 360-74. 5 See Tamara Albertini’s provocative thesis in Albertini, “The Seductiveness of Certainty: The Destruction of Islam’s Intellectual Legacy by the Fundamentalists”, 2003, Philosophy East and West 53, n° 4, p. 455-70; the “damage” done to Islam’s intellectual and scholarly legacy” is the result of a “well thought out strategy designed to remove any scholarly resistance to fundamentalism from within the Muslim world”. 11 A denial re-iterated by the Reformers that gained momentum during the twentieth century and which has finally to lead to the irrelevance of the Amir’s Sufi legacy by the very people who celebrate him as the founder of the Algerian nation and freedom fighter against the French colonialists. 12 Modern Sira-literature shows this reduction of the nature of prophecy and the secularization of religious writing very clearly: see, for example, Haykal’s Muhammad and al-Aqqad’s ‘Abqariyyat Muhammad. 17 Accordingly, al-Kawâkibî’s Islamist “vanguard of free and noble men” who will wake the Umma from its slumber dispense with the unifying principle of prophethood and take as their moto the truncated “la na‘budu illâ Allâh” we worship none other than Allâh. Their war cry, “Zealous guardianship of religion over compassion for Muslims” indicates the beginning of a rift that will henceforth be ever widening: the rift between loyalty for Islam and loyalty to Muslims [al-ghîra ‘alâ al-dîn qabla al-shafaqa ‘alâ l-Muslimîn] (Ummu al-Qurâ, p. 380). Religion becomes a definable entity whose parameters and interests are separable and perhaps even contrary to the welfare of the Muslim people. The reformers drive a wedge between the religion and those who have shaped, informed, and given life to it following in the footpath of the prophets and lovers of Allâh. The modern discourse of reform deepens this gap. 19 Mawqif 110. Quoted in Jawad al-Murabit, 1966, Al-Tasawwuf wa al-Amîr ‘Abd al-Qadir al-Hassanî al-Jazâ’irî, Damascus, Dâr al-Yaqza al-‘Arabiyya, p. 21. 22 ‘Abd al-Qâdir al-Jazâ’irî, 1966: Dhikrâ al-‘âqil wa-tanbîh al-ghâfil, Mamdûh Haqqî (dir. ), Damascus, Dâr al-Yaqza al-‘Arabiyya, p. 11. 23 Muhammad Ibn ‘Abd al-Qadir al-Jazâ’irî, 1964, Tuhfat al-zâ’ir fî târîkh al-Jazâ’ir wa-l-Amîr ‘Abd al-Qâdir [1st ed. Alexandria, 1903], Mamdûh HaqqÎ (dir. ), Beirut, Dâr al-Yaqza al-‘Arabiyya, p. 566. 24 The role of print culture in fostering imagined identities and engendering political activism is now more than adequately demonstrated. 25 ‘Abd al-Mut‘âl al-Sa‘îdî, 1954, al-Mujaddidûn fi-l-islâm min al-qarn al-awwal ilâ al-râbi‘ ‘ashar, Cairo, Maktabat al-Âdâb, p. 470-471. MAKHLOUF, Sanaa. Reform or Renewal? The Debate about Change in Nineteenth Century Islam In : Abd el-Kader, un spirituel dans la modernité [en ligne]. Damas : Presses de l’Ifpo, 2012 (généré le 23 avril 2019). Disponible sur Internet : <http://books.openedition.org/ifpo/1820?nomobile=1>. ISBN : 9782351593271. DOI : 10.4000/books.ifpo.1820. Makhlouf, Sanaa. “Reform or Renewal? The Debate about Change in Nineteenth Century Islam ”. 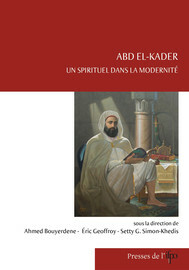 Bouyerdene, Ahmed, et al.. Abd el-Kader, un spirituel dans la modernité. Damas : Presses de l’Ifpo, 2012. (pp. 127-138) Web. <http://books.openedition.org/ifpo/1820?nomobile=1>.